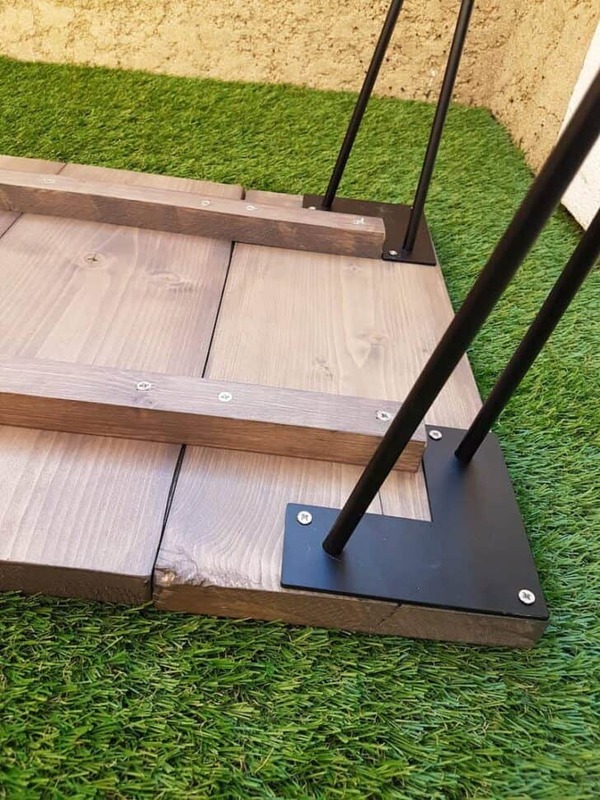 Here is a tutorial to easily make an outdoor coffee table with wood and some simple tools, beginner DIYers, this DIY is for you! 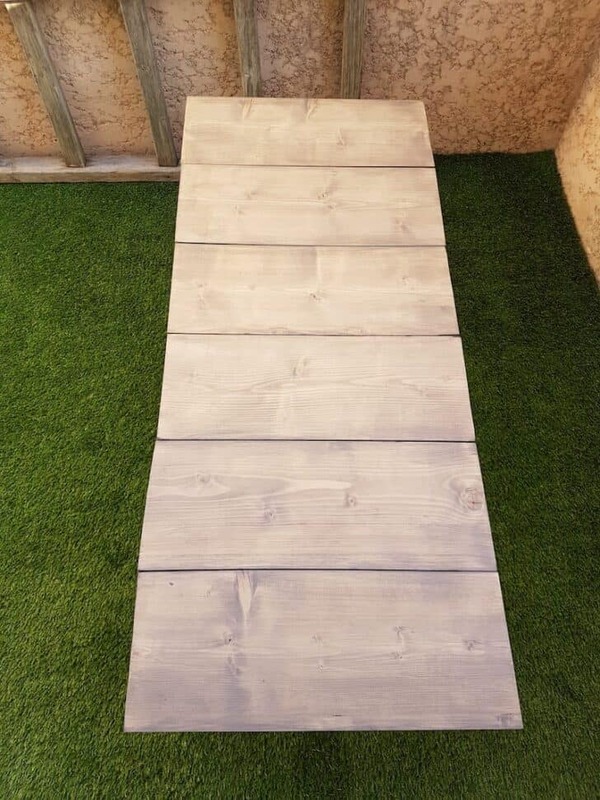 I chose to use Pine as wood because it is a very good quality/price ratio and can be found everywhere, and it absorbs wood stain very well, unlike oak which is much denser. Cut the wooden board into 6 pieces of 50cm each with the circular saw or jigsaw. Take the measurements well before cutting because it is important to have pieces of the same length. Cut the wooden strip into 2 pieces of 120cm each. 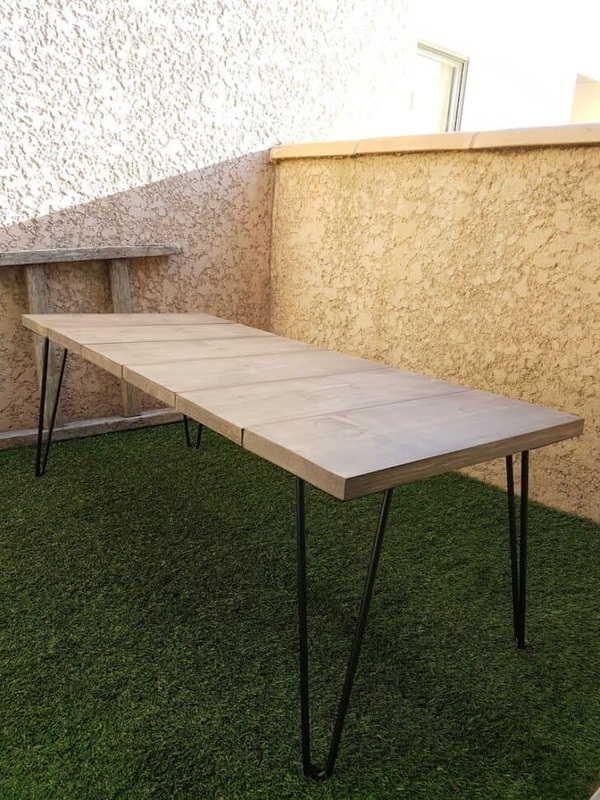 Position the 6 pieces of wood in parallel to simulate your finished table, place the 120cm cleats on the boards 10cm from the long edges and 5cm from the short edges. Mark the drilling points on the cleats so that each board is fixed with 2 screws. Remove the cleats and drill them. Sand all wooden parts with grain 120 and/or 240 depending on the condition of the wood. Apply a coat of glaze with brushes to all wooden parts: the 6 boards and the 2 cleats. Wait at least 6 hours for drying (it depends on the glazes). 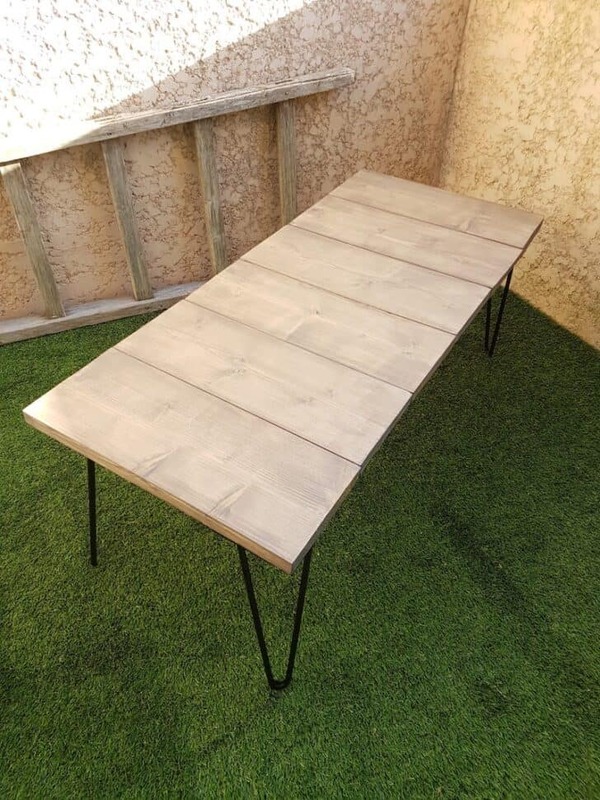 Lightly sand all wooden parts. Apply a second coat of glaze with brushes on all wooden parts: the 6 boards and the 2 cleats. Wait at least 12 hours for the final drying (it depends on the glazes). Choose the most beautiful faces of the boards and position them against the ground/support. 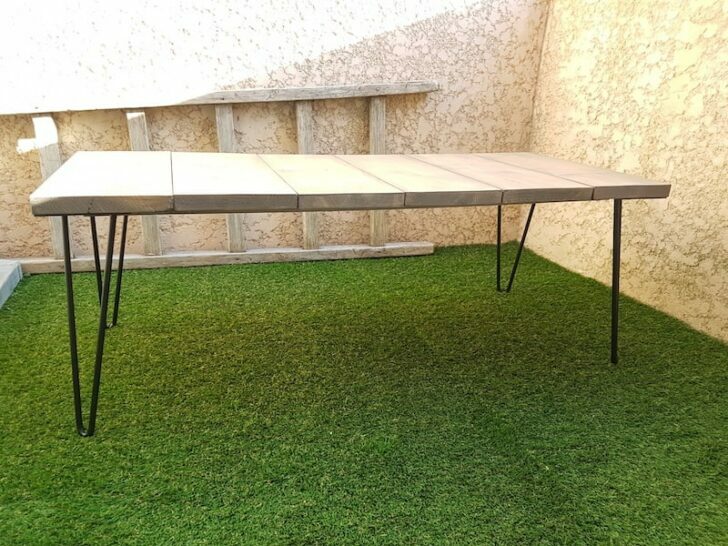 So you see the underside of the table. 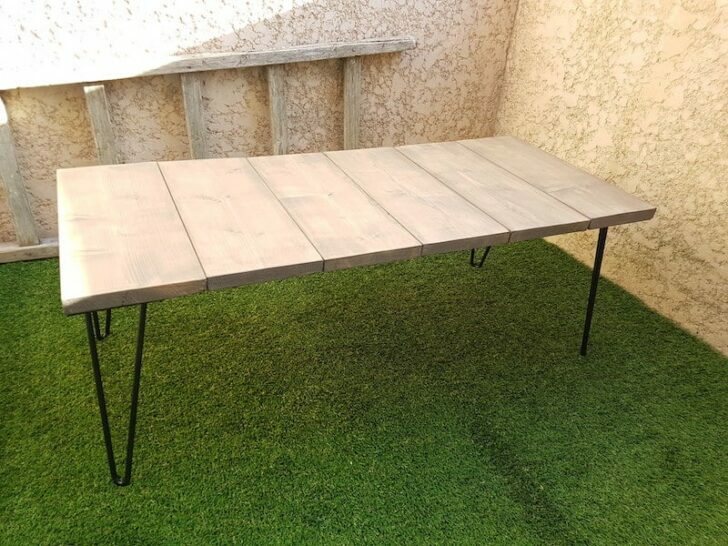 Position the 4 Hairpin table legs to the corners of the table and secure them with the 12 4xL20mm screws. 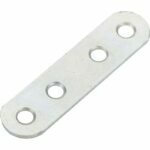 Position the cleats as before and secure them with the pre-drilled holes using the 24 4.5xL45mm screws. 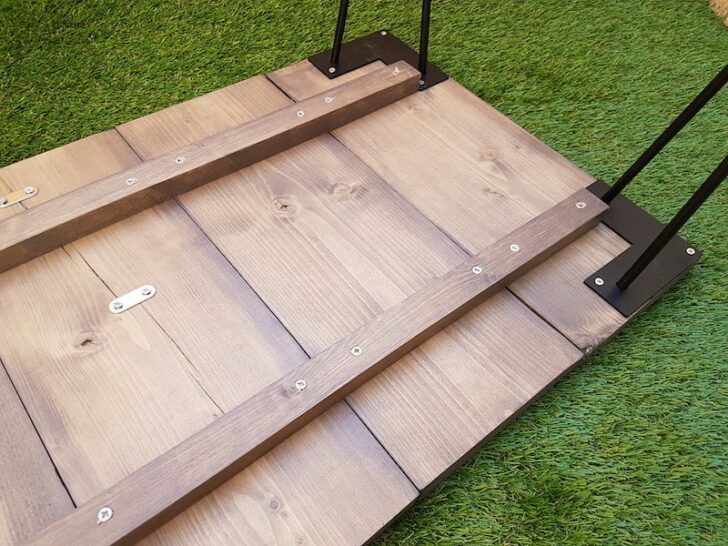 If you see cracks on the boards, use small flat mounting brackets to prevent them from growing. 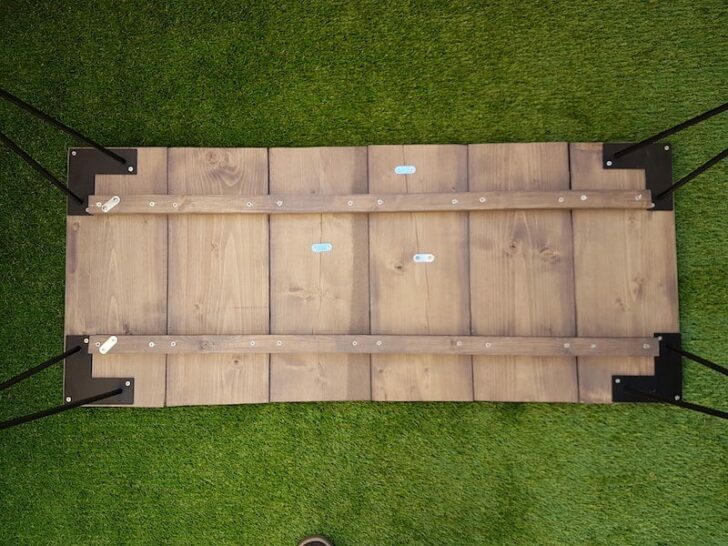 Here you go, your wooden outdoor coffee table is finished and ready to be installed in your garden!